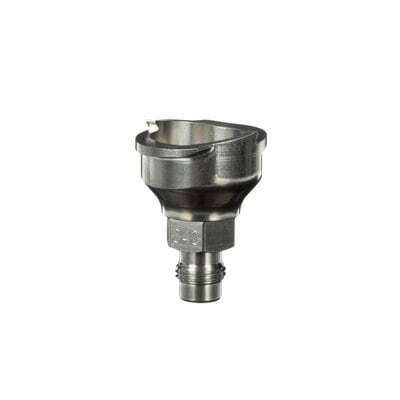 3M™ PPS™ Series 2.0 Adapter is designed to allow almost any spray gun to work with the 3M™ PPS™ Series 2.0 Spray Cup System. 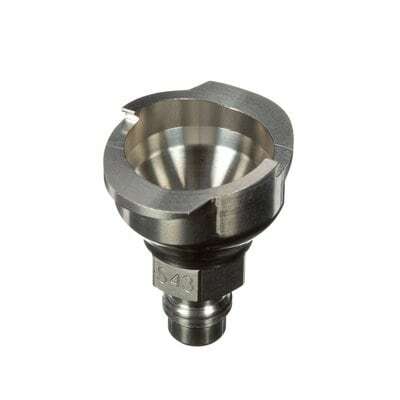 The adapter delivers a solid four-point connection to the PPS™ Series 2.0 cup lid, maintaining a tight, reliable seal even when spraying upside down. 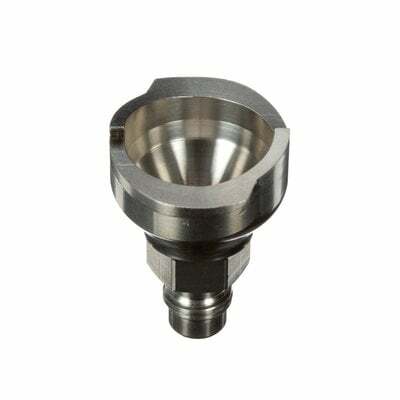 Durable stainless steel adapters are available in a broad selection for a wide range of spray guns. The 3M™ PPS™ Series 2.0 Adapter converts a wide range of spray guns to be used with our 3M™ PPS™ Series 2.0 — the next generation of our highest performing disposable spray cup system. 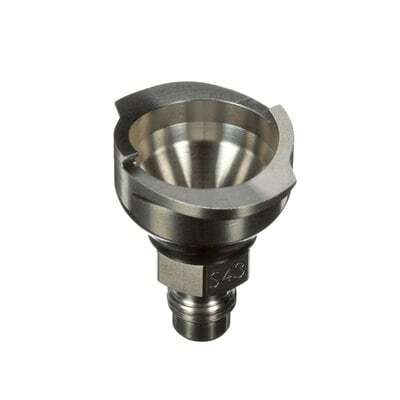 The adapter design provides four points of connection to the PPS™ Series 2.0 cup lid. Stainless steel adapters are durable, resist solvents and are very easy to clean. They are available in a broad selection — with very few exceptions, we have designed a PPS™ Series 2.0 Adapter for your specific spray gun model. 3M™ PPS™ Series 2.0 features hard plastic cups, ¼-turn lid locking system and flexible, collapsible liners. It is available in 5 sizes: 3oz (90mL), 6.8oz (200mL), 13.5oz (400mL), 22oz (650mL) and 28oz (850mL). The 3M™ PPS™ Series 2.0 Spray Cup System is our latest, best-performing disposable spray cup system. 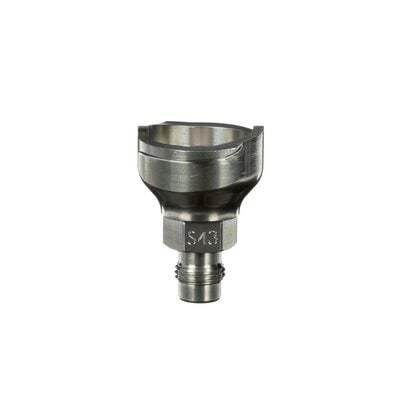 The system has been redesigned from the connection to the cup, and has been improved in six ways offering a complete disposable spray cup solution for mixing/measuring, filtering, spraying and for temporary sealing and protection of sprayable coatings. Every PPS™ Series 2.0 lid features a quarter-turn lid locking system to help reduce paint build-up and possible contamination. 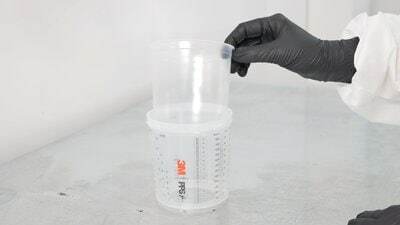 Additionally, each lid and liner kit contains a new hard cup which also features universal mixing ratios built into the cup, eliminating the need for separate inserts and helping ensure the most accurate mix possible. 3M™ PPS™ Series 2.0 makes it even easier to mix directly in the cup. If you're mixing on a scale, use the "max fill" notation on each cup to fit the maximum amount. Cups include a clear access window to help you see how much material is left while spraying. The window also allows you to hold the liner for easier, cleaner lid removal. This is especially useful during refills or tinting. Our 3M™ PPS™ Series 2.0 Lids feature a domed geometry that allows up to 3 oz (90mL) of material below the filter during on-demand spraying. This reduces sputter and other inconsistencies in spray performance. Lids also feature a wider spout for improved fluid flow. A built-in full-diameter filter delivers the highest quality filtration — no assembly needed. 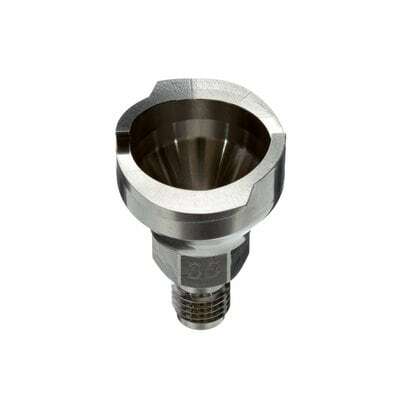 A new adapter design provides a four-point connection and a wider 360° platform to ensure a stable, reliable lid-to-spray-gun connection. Larger sealing plugs do more than just seal. 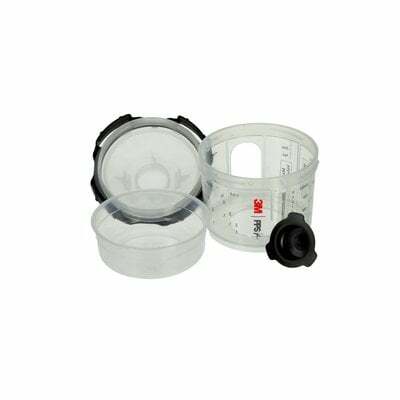 For instance, you can turn the cup upside down and use the new sealing plug as a base for temporary sealing and protecting, helping keep the built-in filter wet and reducing the need for replacement lids. 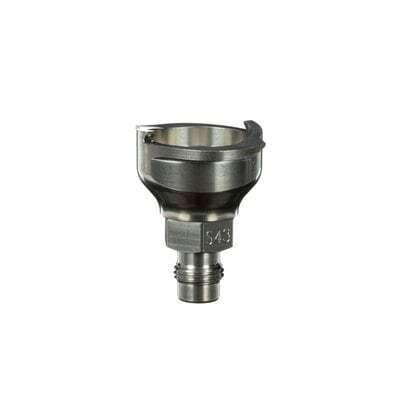 Every lid features a built-in full diameter filter available in 200 micron or 125 micron mesh. Be sure to consult the paint or coatings manufacturer for the recommended filter mesh size. 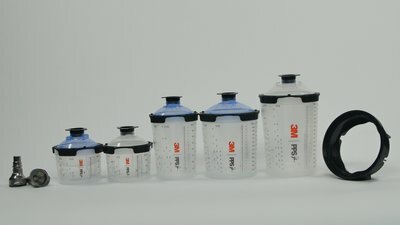 Our PPS™ 2.0 Spray Cup System is available in 5 sizes: 3 oz (90mL), 6.8 oz (200mL), 13.5 oz (400mL), 22 oz (650mL) and 28 oz (850mL). Using the right size cup for every repair not only reduces your cost per lid and liner, it can reduce the likelihood of overmixing. After spraying, the painter can use the sealing plug to seal and protect the paint or coating for later use or simply discard the lid and liner, leaving only the adapter and spray gun to clean. 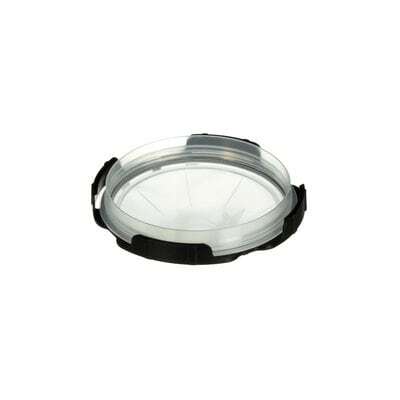 Discard the disposable lid and liner in accordance with local government requirements. Use a small amount of solvent for cleaning the spray gun and the PPS™ Adapter. 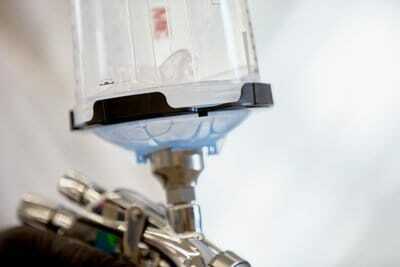 Shops using PPS™ Series 2.0 often experience a 70% reduction in cleaning solvent usage. Most guns can be cleaned with less than 3 oz. of solvent. Because PPS™ Series 2.0 is a closed system, you can spray in any orientation to a full 360 degrees. This allows the painter to spray consistently at 90° to the part, no matter how the part is positioned. It makes material transfer more consistent, limits paint overspray and reduces paint consumption. Because the painter uses a new disposable lid and liner for each mix, there is less risk of outside contamination. Using a fresh lid and liner with each paint job, rather than washing out reusable components, often improves overall productivity in prep and clean-up time by as much as 50%. 3M™ invented disposable cups for paint application and will continue to re-invent based on our customer's feedback. What customers have taught us, is that trust and confidence in their disposable paint cup system is king. The consistent performance of the 3M™ PPS™ System has earned the trust of experts in one of the most important parts of a repair or manufacturing process — paint application. PPS™ Series 2.0 is the culmination of more than 15 years of painter feedback and a true next generation all-in-one disposable painting system that produces cleaner jobs, saves on paint consumption and reduces solvent usage by up to 70%.